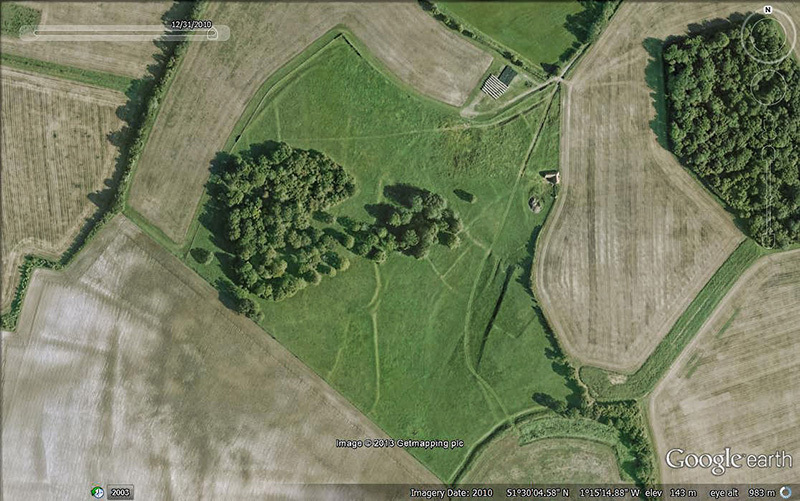 Perborough Castle (hillfort) is a bivallate oval Iron Age enclosure of approx. 14 acres (5.6 hectares). Much of this hillfort has been ploughed away but for the rather impressive northernmost defences, in which there is a simple gap and causeway entrance. Pottery finds suggest an Early Iron Age date. The prehistoric field system to the north and north-west of Perborough Castle, mistaken for the surviving foundations of a ‘British town’ by Edward William Gray in 1839. Though the banks are most easily recognisable by the shadows cast on the grassland, you can also see the ditches inscribed in the ploughed field below. Image © Getmapping. Filtered through Photoshop to highlight features. A geophysical survey conducted as part of The Wessex Hillfort Project identified a large number of likely pits in the western and southern parts of the interior. The centre of the enclosure didn’t return any evidence of occupation, however this may be due to agricultural erosion. On a more intriguing note, the survey suggested that the southern ramparts had been subjected to burning, possibly in antiquity. When the survey was extended to the land outside the southern limits of the hillfort, the signal suggested that a substantial amount of burnt material had been spread over a considerable area. This pattern could be explained by the wooden components of the ramparts having been burned down, and then in more recent years, the farmer filling the ditch with the remainder of the rampart, and slowly spreading the burnt material in successive years of ploughing. He mistakes the field boundaries within the defences for the foundations of long halls, and carrying this identification to the extensive field boundaries outside the defences, envisages a large ‘British town’. Additionally, he mentions a local tradition that states there is a subterranean passage that leads from Perborough Castle to a place called ‘Bantywick’, and that some ploughing teams have reported a hollow sounding patch of ground in that area. Stories of subterranean passages are occasionally linked to hillforts (see Ruborough Camp in Somerset). Gray also reports a ‘vast number of black coals like what are called blacksmith’s clinkers’ being dug out and ploughed out from the external ditch. Unfortunately he doesn’t tell us which ditch. Hewitt, writing a little later, repeats so many of Gray’s descriptions and statements that the reader is left with the distinct impression that he lifted them more or less wholesale, adding a few more details of his own. Interestingly, he also remarks on the amount of burnt material, saying that “it seems evident that this extensive place was once consumed by fire” (3) foreshadowing the results of the 1996 geophysics survey. The account of the site given in the 1906 Victoria County History of Berkshire repeats details from both accounts, and also adds that the original form of the defences was a ‘fosse between two valla’ – a ditch between two banks (a configuration you can also see at Membury Camp 13.5 miles to the West). Marl is clayey deposit, rich in calcium carbonate and has high pH levels. When acid soils are treated with marl, the uptake of nutrients is improved. Pliny the Elder (23 to 79 AD) called it the ‘fat of the land’ and reported its use in Britain and France. (6) If you’d like to know a little more about historical marling, the Upton-by-Chester Local History Group maintain a rather good page here. The Victoria County History entry for Perborough Castle also relates a snippet of local lore which says that there was a castle on this site which was blown down one night. Not the fullest of tales, but worth preserving none-the-less. OS map reference: SU 5177 7796. Nearest town/village: Compton. 2. Gray, E. (1839). The History and Antiquities of Newbury and Its Environs: Including Twenty-eight Parishes, Situate [sic] in the County of Berks. Hall and Marsh. 3. Hewett, W. (1844). The History & Antiquities of the Hundred of Compton, Berks. John Snare. 4. Page, W. (1906). The Victoria History of the Counties of England: Berkshire. London: Constable.